Collections of saprobic dematiaceous hyphomycetes on dead Poaceae from the high mountains of western Panama revealed a new species of Shrungabeeja and new records of Pendulispora venezuelanica, Phaeostilbelloides velloziae and Spegazzinia tessarthra. The new species differs from the most similar other species, Sh. vadirajensis, by narrower conidia being longer than wide and having a basal appendage. A hitherto unknown generic characteristic of Shrungabeeja is the development of internal monilioid hyphae in the conidium, extending from the short reverse-trapezoid, dark brown basal cell into the appendages. 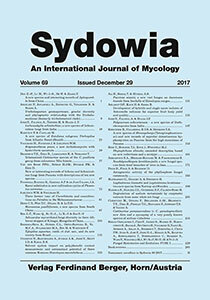 Examination of conidia of S. tessarthra at different stages of development challenges the traditional classification of conidium ontogeny in Spegazzinia as basauxic. Keywords: Ascomycota, fungal ecology, Pleosporales.